SYNOPSIS: Percy Jackson, a thirteen-year-old “half-blood”, whose mother is human and whose father is the God of the Sea, makes an action-packed comeback in Rick Riordan’s Greek mythology-based book series. 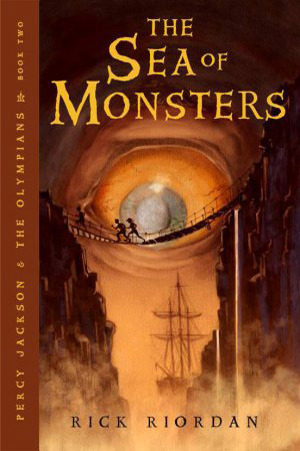 In this second installment, demigod Percy Jackson and his friends rescue his satyr friend Grover from the Cyclops Polyphemus and save the camp from a Titan’s attack by bringing the Golden Fleece to cure Thalia’s poisoned pine tree. Well, I’m almost done reading this story in ebook form, which I just started yesterday while at work. I love these kinds of stories, reading them is akin to a bag of hersheys “cookies and cream” kisses in front of me — it will be finish in no time! LOL! Anyway, I’ve read the first book “The Lightning Thief” back in 2011 when the movie came out. The movie wasn’t bad but it wasn’t good either. They made a LOT of major changes. The book was so much better, which is not actually surprising. However, it took a while for me to continue with the series ever since I came here in Qatar. I can’t seem to find the book set here, but nevertheless, the adventures of Percy Jackson is an interesting read for anyone who loves mythology.